here is the new non brown version of pink sugar! To the left and behind it is the newest batch of Black Raspberry Vanilla. It is the busy time of the year and I have been busy pouring candles. So I haven't had a chance to keep everyone up to date in the blog. As soon as the rush passes I will be back to my normal blogging. 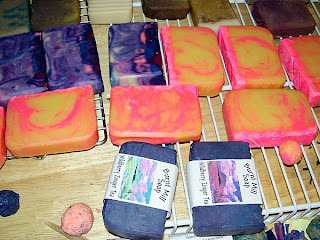 I did happend to make a really cool looking batch of Black Raspberry Vanilla soap over the weekend. I will do my best to get a picture up soon so you can all get a peek of it before everyone else does. ok back to pouring holiday orders I go!